Each Hobby Jumbo Box contains Three On-Card Chrome Autographs! 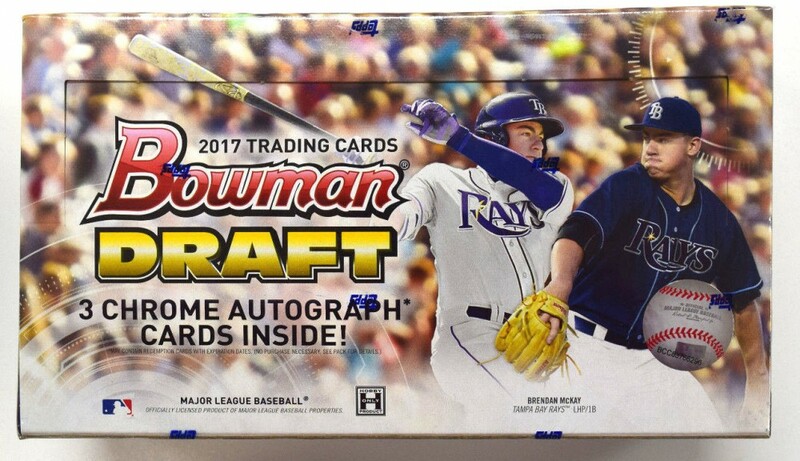 Each CASE contains One Class of 2017 Autograph featuring On-Card Autographs of 2017 MLB Draft 1st Round Selections! 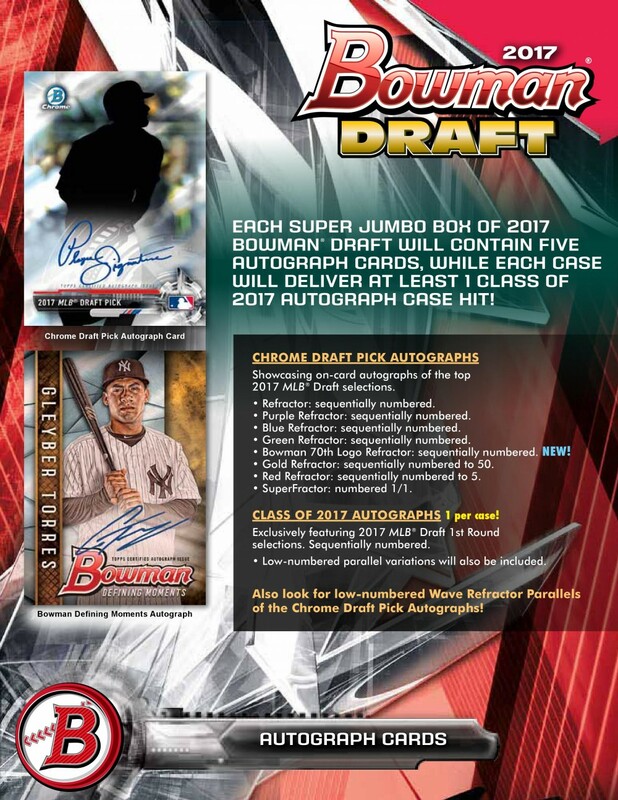 This year's Jumbo Box offering will contain three on-card chrome autographs per box, along with a compelling mix of new insert content and Base Cards of top MLB Draft picks. 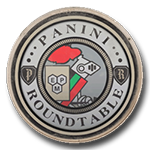 Also look for revamped insert subsets including rare Image Variations and additional sequentially numbered Refractor parallels. Each Box contains 384 total cards! 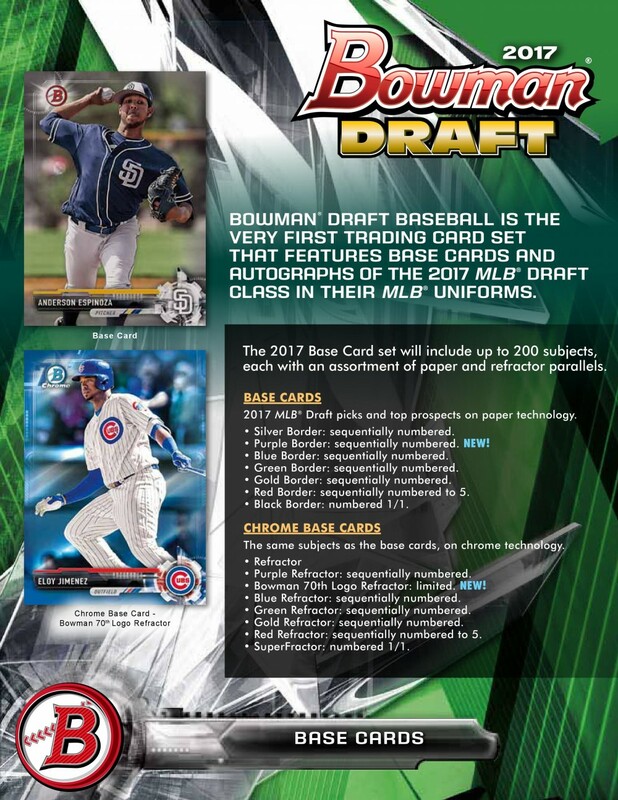 Bowman Draft Baseball is the very first trading card set that features base cards and autographs of the 2017 MLB Draft Class in their MLB uniforms. The 2017 Base Card set will include up to 200 subjects, each with an assortment of paper and refractor parallels. 2017 MLB Draft picks and top prospects on paper technology. - Silver Border: sequentially numbered. - Purple Border: sequentially numbered. NEW! - Bowman 70th Logo Refractor: limited. NEW! 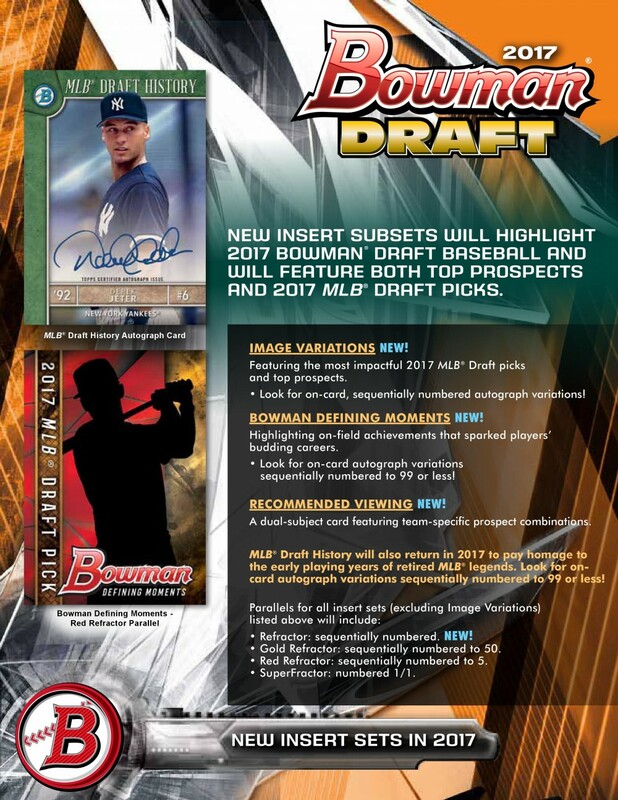 New insert subsets will highlight 2017 Bowman Draft Baseball and will feature both top prospects and 2017 MLB Draft picks. Featuring the most impactful 2017 MLB Draft picks and top prospects. - Look for on-card, sequentially numbered autograph variations! Highlighting on-field achievements that sparked players' budding careers. - Look for on-card autograph variations sequentially numbered to 99 or less! A dual-subject card featuring team-specific prospect combinations. MLB Draft History will also return in 2017 to pay homage to the early playing years of retired MLB legends. Look for on-card autograph variations sequentially numbered to 99 or less! - Refractor: sequentially numbered. NEW! 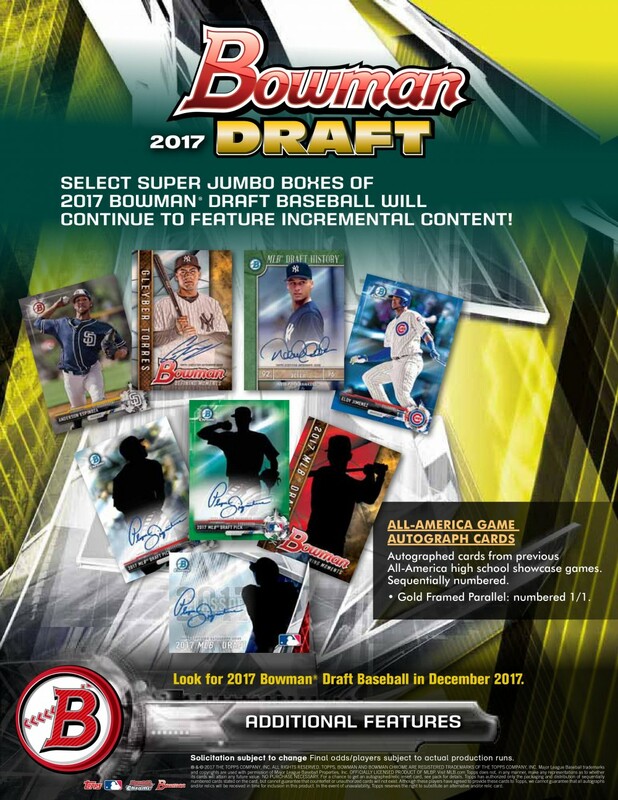 Each Jumbo Box of 2017 Bowman Draft will contain three autograph cards, while each case will deliver at least 1 Class of 2017 Autograph case hit! Showcasing on-card autographs of the top 2017 MLB Draft selections. - Black Refractor: sequentially numbered to 75. JUMBO BOX HOT PACKS ONLY! - Bowman 70th Logo Refractor: sequentially numbered. NEW! Class of 2017 Autographs: 1 per case! Exclusively featuring 2017 MLB Draft 1st Round selections. Sequentially numbered. Also look for low-numbered Wave Refractor Parallels of the Chrome Draft Pick Autographs! 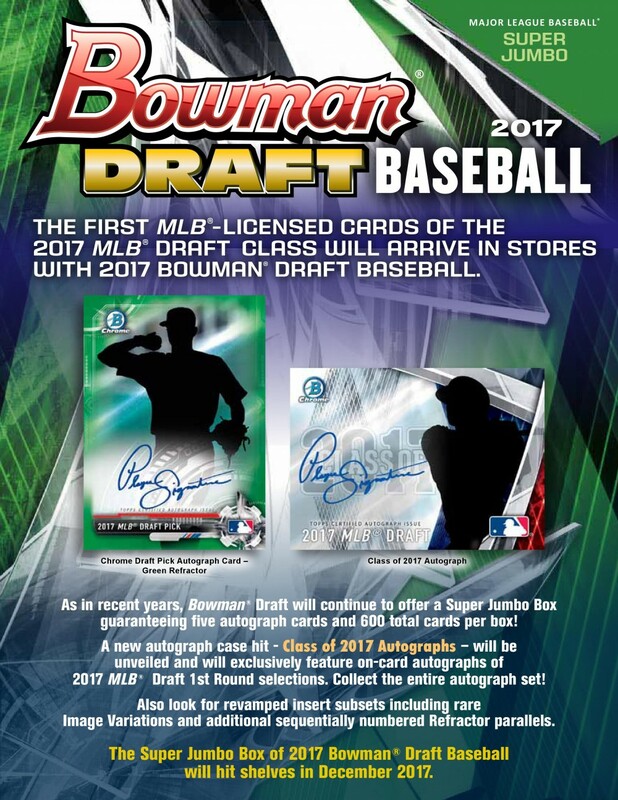 Featuring the biggest names from the 2017 MLB Draft class on an oversized chrome card. Sequentially numbered.